Prospective clients from across Victoria, NSW and Tasmania braved gale force winds and dust storms to attend the 46th Annual Mawarra Genetics Sale on Monday. 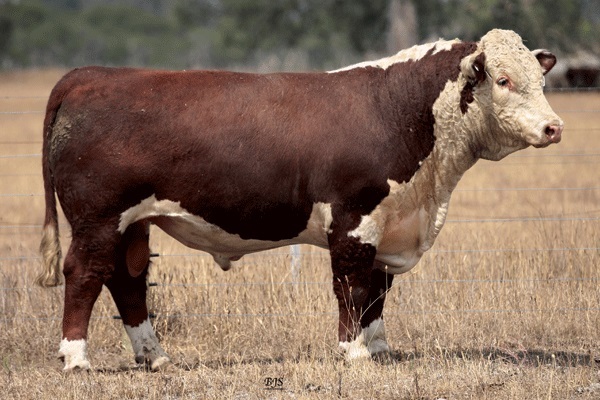 A 74% clearance saw 56 bulls sell for $14,000 twice, to record an average of $6000. Drawing in new clients from across three states, the Mawarra principals were delighted to see more producers putting trust in their genetics. ‘These genetics are going to be the future of our clients programs. Given we think the beef industry set for great things when the weather breaks, the sires we have offered today will set producers in good stead to be ahead of the game,’ said Mawarra Co-Principal, Deanne Sykes. Long-standing Mawarra client Alistair McKoy, McKoy & Son, Holbrook, NSW, purchased the two-equal top-priced lots of the day at $14,000. Lot 10 Mawarra Gentleman was sired by Mawarra Calibre. A March calf, he weighed in at 977 kgs with an average daily gain of 1.33. Lot 11 Mawarra Global N065 was sired by Mawarra Daybreak. ‘This sire line boasts industry leading EMA and IMF, excellent growth and positive fats offering producers high performance and increased profitability,’ said Deanne. ‘This was our first draft of Daybreak sons and their potential wasn’t overlooked with ten selling to an average of $8,000.’ Jeanette McCormack, Tallangatta, continued her long running support of the Mawarra program by purchasing two Mawarra Daybreak sons; Lot 9 Mawarra G&T for $10,000 and Lot 42 Mawarra Golden Eye for $7,000. Popular sire, Koanui Techno 3062, sired the second top-price bull, $13,000, Lot 65 Mawarra Ringer (AI) (PP). The Homozygous Poll bull was purchased by Craig Lloyd and Ken & Kym Skews, from Ensay. The young sire has an impressive EBV spread and weighed 770kgs at 20 months. A number of purchasers took advantage of the buyers’ market to secure multiple sires and/or females for their programs. GT Farmer, Ensay, D & J Ingram, Bonang, Milroy Pastoral, Byaduk and M Wiemann, Hill End all secured three lots each. Tarcoola Herefords, Casterton, G & E Moutray, Codrington, Batty/Valentine, Swifts Creek, Turner Partnership, Bindi, Cleveland Pastoral, Ouse, P & C Faithfull, Omeo and Tablelands Pastoral Co, Boisdale all secured two sires each. Mawarra Global N065 sold for the equal top price of $14,000 to Alistair McKoy, McKoy & Son, Holbrook, NSW.